In the 90s Bruce Willis was Nicolas Cage with a better agent. He seemed to say ‘yes’ to every script offered, but unlike Cage the bombs weren’t as egregious and career threatening. Of course it helped that about every four or five years Willis managed to pop up in a Great film; Die Hard, The Fifth Element, The Sixth Sense, Pulp Fiction, Looper… Live Free or Die Hard… OK not the last one, but you get the picture. Striking Distance was one of the films that sunk without a trace. And for good reason. Bruce plays Tom Hardy, an ex street cop assigned to the case of the Little Red Riding Hood serial killer, left tormented by a horror evening that left him with a permanent limp, a deceased father, and the Little Red Riding Hood killer still roaming free. Incredibly the aftermath is just as bad, with Hardy loathed by his peers after his subsequent ‘ratting’ on his partner lead to him leaping off a bridge rather than facing judgment, and ultimately Hardy’s demotion to the marine police. If this film is to be believed half of the world’s crimes take place on or near rivers. Over the next hour Hardy cruises past crimes of every type, yet still manages to find some free time to continue his personal investigation into the Little Red Riding Hood killings, which coincidentally seem to have once again started up, despite the protestations of the police force who find them all merely random occurrences. As the bodies mount up it seems that half of the police force line up to have cryptic chats with Hardy at his isolated old shack, that is when he’s not ‘mounting’ Jo that is. It’s all very routine and very depressing really, not nearly as exciting as being in the marine police. And then, mercifully, it’s over, and Bruce can cash his cheque and await the next Great script to be pushed under his door. Cos this sure wasn’t it. Final Rating – 5.5 / 10. 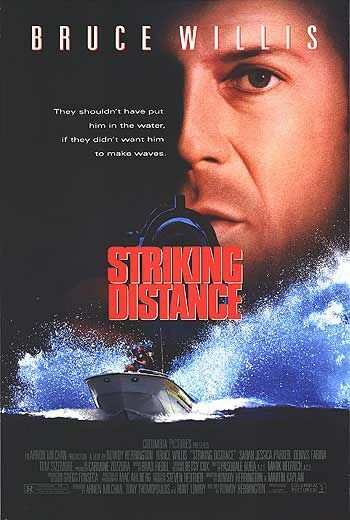 I have no idea what Striking Distance refers to. I do know that this film sure isn’t within Striking Distance of appearing in Bruce Willis’ top 20.